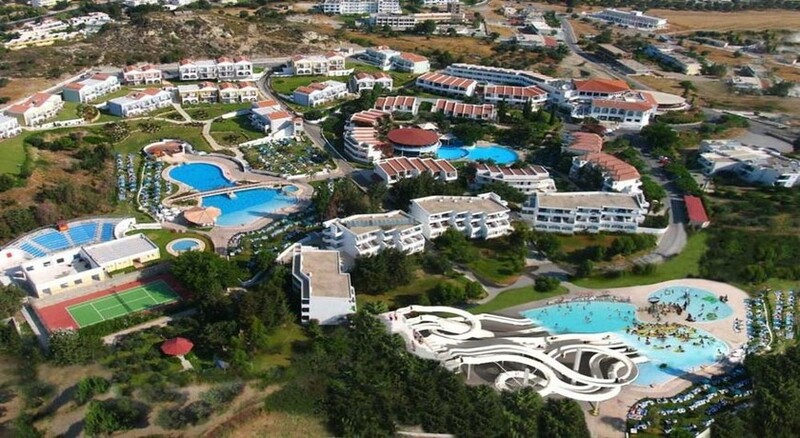 The Cyprotel Faliraki Hotel is a 4-star all inclusive resort based in Rhodes. The beautiful two-story complex is an ideal holiday destination for every type of guest. The family-friendly hotel has 12,000 square meters of gardens and lush scenery, making it a tranquil stay. The hotel boasts lovely restaurants and bars on-site including a pool bar for guests to enjoy during the day. The Cyprotel Faliraki has entertainment for the whole family, including a teenage area equipped with various hi-tech games, as well as fun kids sports like water polo, which guests can take part in at their leisure. Better still, there is an amazing on-site waterpark too, a unique feature of the Cyprotel Faliraki Hotel and a main attraction for many guests, which is often one of the holiday highlights with multiple slides, a kids’ pool and complementary sun loungers. You can also hire cars, motorbikes and bikes if you choose to go on a day out to the shopping centre in Rhodes town or the nearby sandy beach. The Cyprotel Faliraki Hotel is on the East coast of Rhodes and is a short 15-minute walk from the stunning sandy beach. If you fancy a shopping trip, the Faliraki shopping centre is only 1.5km away or if you want to explore even more you can visit the shopping centre in Rhodes Town - it’s a little further down at 17km away, but worth the drive. In addition, the airport is just a 20-minute drive away so it’s very convenient. There are many room types available for guests, such as: Standard Room, Family Room with Bunk Beds, Family Room with Sliding Door, Family Room with an Extra Room, and Budget Room. These all have TV’s and air-conditioning partnered with mini fridges. All rooms have a neutral colour scheme, so guests can relax in the evenings and wake up to light calming surroundings. The main restaurant has a buffest style service that opens at 7:30 for breakfast and closes at 10:00, it then opens again for lunch at 12:00-15:00 and again for dinner where it serves all kinds of dishes, served hot and cold, as well as deserts. This runs from 18:30 to 22:00. There are three bars; the main bar that’s open from 10:00-24:00, the pool bar which is open from 10:00-24:00 (these both offer alcoholic and non-alcoholic drinks) and the snack bar that opens at 15:30 and closes at 17:30. There are also themed buffets three times a week in the main restaurant that offer traditional Greek food, Italian and a BBQ night. The thrilling waterpark that has multiple slides is open from 10:00-18:00. It’s the perfect place for the kids to have a splash-tastic time, without leaving the hotel! Or, if you would rather play the 18-hole golf course or mini golf – this is also available for guests. In addition to all this the hotel has a range of activities running throughout the day for children ages four to 12, six times a week. The teenage area has a disco club, a Café and a PlayStation, so there is plenty of things to do to keep guests entertained. Check-in: 14:00pm, minimum age is 18. No pets are allowed (including service animals). Mastercard, American express and visa are all accepted as payment types. There are 365 rooms in total. The main language spoken is English, but Greek is the native language so is spoken as well. There is free self-parking available for all guests. the booking was seamless, very informative travel adviser and no hidden costs. Very pleased with the hotel on arrival and this continued through the whole 2 weeks! Nothing to complain about at this hotel. Rooms were comfortable, food was tasty and loads of it! Staff were constantly cleaning up around us. Animation team were really good fun and had everyone dancing round the pool every day. The aqua aerobics was the funkiest workout I've ever done. Even the men were joining in!! There's a shuttle bus that picks guests up and takes them to the local beach which has loads to do, plenty of water sports, bars and restaurants. Good selection of food. Clean rooms and enjoyable entertainment. Kids had lots of fun loved the water slides, pizza was always good if all else failed, overall had a great week. This was a last min booking. Its a clean hotel with good size rooms. The breakfast and evening meals are borinf and repeated...yawn!! 3pm snack time pool side is better. Pool side bath were amazing very hard workers very friendly. Free mini bus to beach a few times a day. Nice touch. The complex needs a re vamp as its tired in places. Great place for the kids not for couples. Very basic. Not a great deal going on in the evening. Good poolside entertainment bit nothing for teenage kids.